Available in shoe and boot styles, Keen Women's Targhee II is the ideal hiking partner. The rugged Targhee II gives you the comfort and support of an athletic shoe and the resilience and protective features of a rough-and-tough hiking boot. This style keeps your feet dry and your step steady thanks to a waterproof nubuck upper, 4-millimeter multi-directional lugs, and a Keen.Dry waterproof membrane. And for exceptional support mile after mile, the Targhee II combines an S3 heel structure with a dual-density, compression-molded EVA midsole and a Keen Metatomical EVA footbed. S3 stands for Shock, Suspension, and Stability and refers to Keen's unique heel-support structure. S3 is engineered to support the foot on impact, which dissipates shock, helping to prevent injury to the ankle. For comfort and support that won't quit, the Targhee II features a removable, dual-density EVA footbed that provides arch support by hugging the natural contours of your foot. The compression-molded EVA midsole extends the benefits of the footbed and adds an extra spring to your step. To give you a steady grip on all kinds of terrain, the Targhee has 4-millimeter, multi-directional lugs on its non-marking rubber outsole. These lugs are spaced wide apart to "bite" into the terrain, giving you more dependable traction on slippery and uneven surfaces. Keen began in 2003 with an inspired sandal design that combined comfort and toe protection. This radical design departure for sandals spawned the overriding Keen philosophy of hybrid innovation--striving to create new possibilities and to discover and implement original ideas. 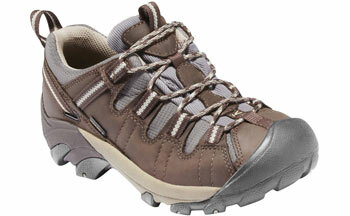 Keen Women's Targhee II Waterproof Trail Shoe.